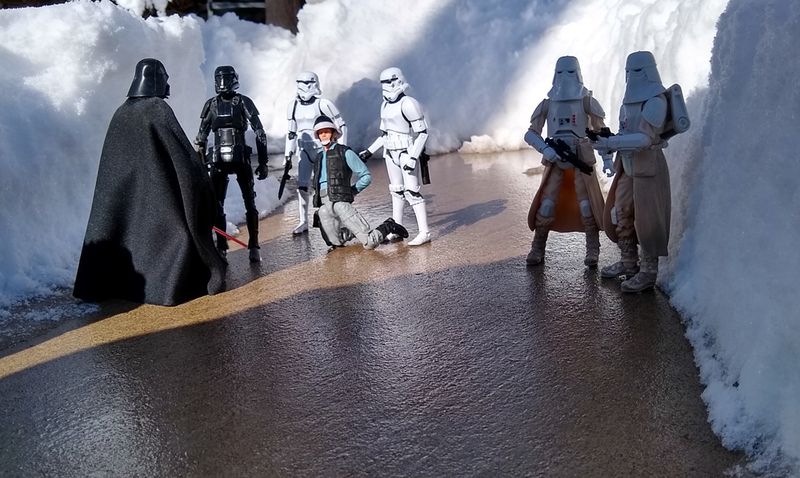 Okay, so this is another one of my action figure photo series. I think every writer should do stuff to get in touch with the characters they are writing for especially if the characters and setting are not based on reality. I am currently writing Star Wars Universe stories. I am a fan, but I don’t write fan fiction. My writing follows certain rules like respecting the characters as they have been developed. Acknowledging and understanding the setting as it has been established. So what does that mean? Darth Vader doesn’t need a hot babe to solve all his problems. That would not follow with why he is Darth Vader. That would show a blatant disregard for what has been established for the character and a serious lacking of understanding of who Darth Vader is. One always hears actors ask, “What is my motivation?” Well, that is important in writing as well. Now, don’t get me wrong….some of the fan fiction out there is well written, and some of it should be flushed down the toilet where it belongs. Fan Fiction gives people a chance to express ideas and improve their writing skills. That’s not enough for me. I want my stories to be published and shared with those that love Star Wars. I want to return the joy that I felt as I watched and read throughout the years. 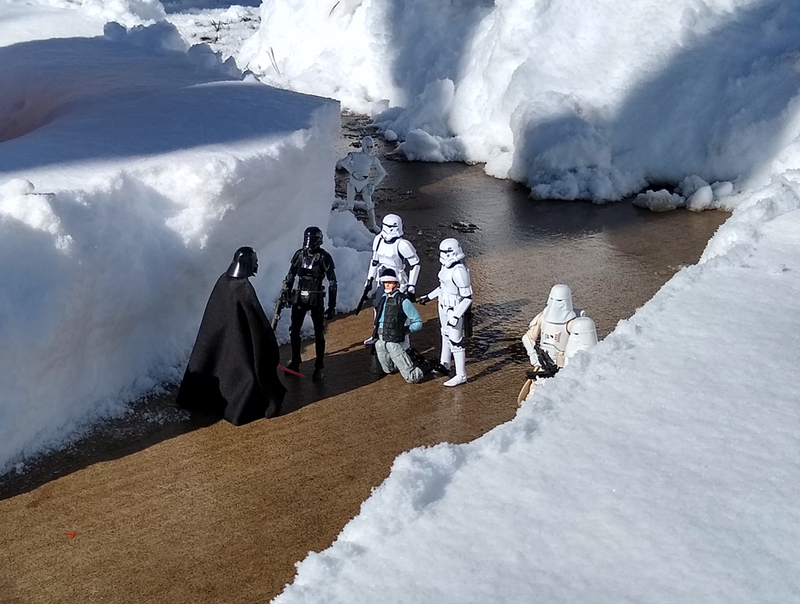 So the snow today has inspired my thoughts to turn to the planet Hoth where the Empire Strikes Backs begins. I have a few of those Hasbro Black Series 6 inch action figures. 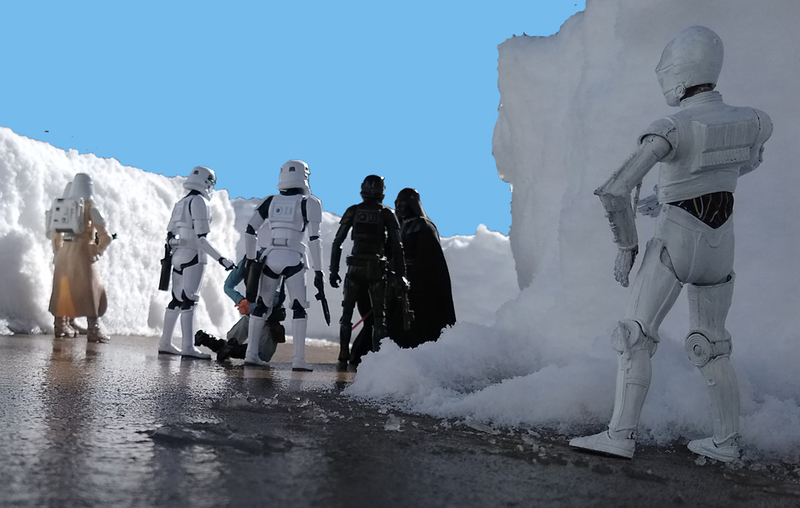 So I gathered up a few that I thought would make sense for a Hoth inspired scene. But being out in ultra white snowy bright conditions has its hazards….snow blindness. Yes, that is a thing. You end up with a headache and an aversion to bright light. It takes about a day for it to go away, at least for me. It is unpleasant. Then the other problem to contend with….the camera, which is actually my cell phone. It has great resolution, but the Moto phone doesn’t work as well as my old Samsung. I literally cannot not see the screen while I am outside in such bright light. Even pulling my sunglasses away, I cannot see the screen. 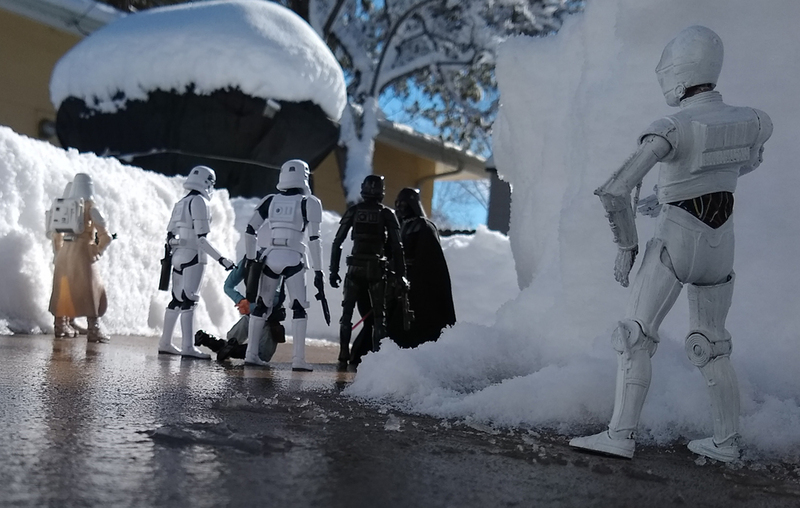 I had to set up my figures and guess how things would look in each shot. The following are the results from my blind attempt. Good thing I am not spending millions of dollars to film an action adventure scene while doing it with just the Force to see with. These three look pretty much the same except with some mild lighting differences. The giant shadow was me being in the way. Another thing to be mindful of when taking pictures or filming. Is the camera and operator inadvertently getting into the scene? This is how the scene looked from above. By crouching down on the wet cement, I was hoping to get that tunnel affect of being in an area with very high snow. The previous images were all lacking the other figure that I wanted to be in the shot. Because I could not see the phone screen while taking the pictures, I could not tell if I was at the correct angle or if I needed to move the figures around. Here I changed camera angle to make sure my protocol droid was included in the scene, but once again….I could not see the screen on the phone, so I could not tell how much of the house and other illusion breaking items had gotten into the shot. This probably would have been fine if a brilliant blue sky was the back ground image. One could attempt to Photoshop the house and so forth out of the picture. Below is my attempt to remove the unwanted background clutter that breaks the illusion. It does look better. 🙂 The final picture is what I was hoping for, but what I got was blurry. I wanted the white droid to be in the background like he was surprised or hiding from the Imperials as they discuss the Rebel captive kneeling upon the ground. He was supposed to be one of those details that people notice only after looking at a picture for some time. A blue sky would also be useful in this image, but it lacks the clarity that I wanted. I hope you had fun looking at these and will be inspired to do even better photos. ‹ Star Wars: Solo the movie and the book….